How do you get from Chinese food to Jack the Ripper to Sherlock Holmes? Well, I’ll tell you. 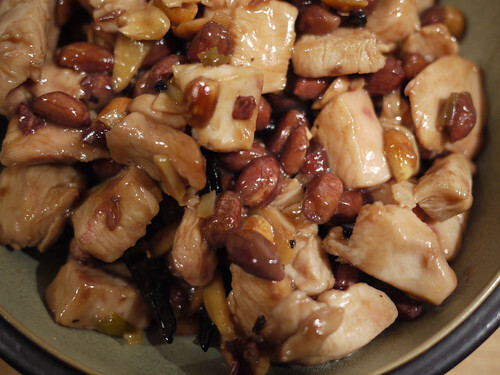 For weeks now, M and I have been craving Gung Bao chicken (also called Kung Pao), a fragrant and spicy combination of stir-fried diced chicken, garlic, ginger, Sichuan peppercorns, dried red chili peppers, and peanuts, finished with a light sauce made of soy sauce, potato starch, vinegar, and sugar. And why were we craving this dish? Well, aside from the fact that it’s both delicious and difficult to get in our neck of the woods, there’s this Decemberists song called “This is Why We Fight”, and in this song, they sing, “Kung pao” over and over. Not really. They’re really singing, “Come hell”, but it sounds like “Kung pao” to us. And once we started singing it that way, we started craving the dish. Thanks to Fuschia Dunlop and her book of Sichuan recipes, Land of Plenty, we had the recipe. We just needed to find the time. This weekend, we made the time because we couldn’t stand the craving any longer. While we’ve made several recipes from Dunlop’s excellent book of Hunan Chinese recipes, the Revoluntionary Chinese Cookbook, this is the first time we’ve cooked from Land of Plenty. If the two dishes we made tonight (we also tried one of the recipes for dry-fried green beans, which was easy, fast, and delicious) are any indication, this book is just as good as the other. During dinner, M remarked on the coincidence between the “Come hell” line from the song and an article he had sent me earlier in the week about the possible identity of Jack the Ripper, a surgeon named Sir John Williams. The connection between the song and the article was lost on me until he reminded me that one of the famous Jack the Ripper letters was referred to as the “From Hell” letter. I got goosebumps, the prickly, near-teary feeling I often got as a kid when I’d read an Agatha Christie mystery and all the clues began to align and I suddenly saw the connections where once there was complete disorder. It’s sort of the feeling you get when you finally make a Magic Eye picture resolve into a 3D image, only larger. It’s the knowledge that each thing really is connected to something else, and it’s only because we humans are so busy staring at our little slice of life each day that we miss the chain of associations. It’s like arriving at a unknown intersection and suddenly realizing where you are. So, there we were, lead by cravings and associations to Victorian England, when we realized that H was busy reading Sherlock Holmes stories for the first time in almost a year because she had sworn them off as her New Year’s resolution because a certain Sherlockian Hound-Who-Shall-Not-Be-Named gave her the extreme willies. But the craving was there, and could not be ignored, so not only did she start reading the stories again, but, as I type, she’s streaming episodes from the wonderful BBC series starring Jeremy Brett. And now here I am, having traversed this crooked path today, from music to food to history to mystery, wondering what you’re thinking right now, and where this chain of connections could lead next.